If you’re considering selling your products in person at an event like an art show or craft fair, don’t expect to be able to wing it. You need a plan in place so you don’t end up wasting a whole weekend lugging around a bunch of inventory that nobody buys. There are three stages to work through if you want to properly plan for these types of selling situations–and we’re going to walk you through each one. Let’s start with the pre-event stage, in which you’ll set yourself up for success before you even leave the house. Before committing to booth rental at an art show or craft fair, you need to be sure that the event is both relevant and financially logical for your business. That means doing some initial research. 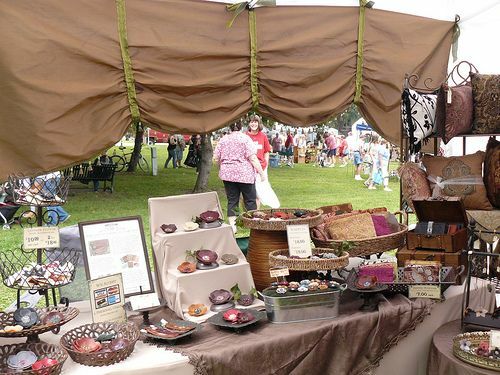 Note: Craft fairs like Renegade have an application process that begins far before the event. Start planning early! How many people attend on average each year? Are they mainly men or women? What’s the common age range of attendees? What’s the average spend per customer? You’ll be better suited for success when you’re certain that the audience for this event falls within your target market. For example: You probably wouldn’t want to get a booth at a craft fair that’s mainly for high-end home decor if you’re selling low-end, trendy jewelry. The audiences for these offerings are just too different, and it’s unlikely the attendees would be interested in your offerings. Setup fees associated with a POS for processing credit cards (if you don’t have one yet). This part is especially important if you’re selling low-cost items with a small margin. If there’s a chance you could end up investing more than you could potentially make at the event, you may want to reconsider the opportunity. Once you’ve decided on a craft fair or art show that makes sense for your business, it’s time to plan out your booth so you can attract many customers and sell more goods. Your booth is a representation of your brand–and it needs to look that way. That means planning out the look and feel of your setup to ensure you have everything you need when the event finally rolls around. If you’re not sure how you want your booth to look, explore photos from past years of the event to see what other vendors put together. Pinterest also has a lot of great images you can browse that will help you come up with creative displays and themes for your booth. Friendly reminder: You don’t want your booth to feel cluttered or too empty, so try to find a balance between the two. NOTE: It’s easy to accept credit cards with the PayPal integration and Ecwid. You can even get a card reader–and you’ll be able to accept payments worldwide. With everything neatly organized, you can simplify the setup and tear-down processes so that everything is ready in just a few minutes. It’s always a good idea to have someone come along with you at an event so that the booth is always supervised. If you attend alone, it can be tough to find a good time for bathroom breaks and food–and you may have a hard time handling periods of high-traffic. After the event wraps up and you’re back at home, it’s time to reflect on the experience so you can do even better at the next art show or craft event. Did you make a worthwhile profit from the event? Did you gather valuable feedback from customers? Was the location/demographic a good fit for your business? How did your prices compare to your competitors’ within the marketplace? As you evaluate, you’ll have a better idea of how to proceed with similar events moving forward. You might find that in the future, you’d like to try out different events, or that the one you attended was extremely successful for your business. Art shows and craft fairs can be a great way to get in front of new customers for your online or brick and mortar store, but remember: You need to plan ahead. Follow the three stages outlined here, and you’ll be taking a strategic approach to all your events in the future.